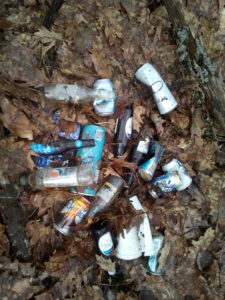 Almost every day I pick up trash along the road near my cabin. Not just on my property but any where I walk. Too many people are pigs! Here’s one days collection. Not all new. So I have made a sign. Now I just need to get it printed. Somebody is obviously regularly sitting in their car in one spot drinking Bush and Michelob Ultra and tossing out the empties. I pick them up and soon there are more. 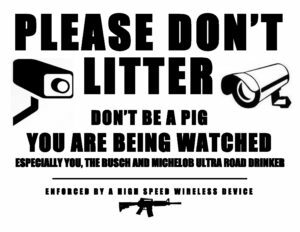 Since my cabin can’t be seen from the road I guess they feel safe to be pigs.